AUGURI, IT’S GREETINGS TIME ! To all of you, we wish you a lot of love and peace for a romantic Christmas and a better New Year! Restaurants with a view in Italy ! 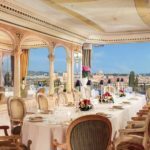 It ‘s time for romantic dinners and even for wedding proposals, if you are looking for a restaurant with a spectacular view over the city, the snow-capped peaks , the blue ocean … here are some of the most romantic hotels in Italy, from the mountains the north Italy to the southern coasts….